Traditional eyeglasses and contacts can do an excellent job of corrective refractive errors such as myopia (nearsightedness) and hyperopia (farsightedness) — but some people are less than happy wearing any kind of corrective lens all day long. If you’re one of these people, you need to know about a special type of contact lens that actually corrects your vision as you sleep. This advanced form of eye care is known as orthokeratology, or “Ortho-K” for short, and you can get it right here at The Plano Eye Care Center. Many vision problems are caused by abnormal eye shape or corneal configuration that prevents light from being refracted and directly toward the retina accurately. These refractive errors not only includes nearsightedness and farsightedness, but also astigmatism (areas of irregular corneal curvature) and presbyopia (a combination of nearsightedness and farsightedness that primarily afflicts people over 40). For centuries, the only means of treatment available was corrective lenses that compensated for the refractive errors. In recent decades, laser surgery presented another option for people who didn’t want to bother with lenses at all. Ortho-K offers lens-free convenience without having to undergo surgery. Ortho-K lenses are gas permeable contact lenses designed to be worn all night while you sleep. These specially-crafted lenses temporarily correct the shape of your corneas so that when you wake up and take them out, you continue to see with at least 20/40 (and ideally, 20/20) visual acuity. Orthokeratology is most widely recommended for nearsighted patients, but some kinds of Ortho-K lenses can also correct for mild astigmatism, hyperopia and even presbyopia. It should be noted that this form of treatment isn’t necessarily for everybody. If you have a strong corrective lens prescription, dry eyes syndrome or unusually large pupils, you may not be good candidate for Ortho-K. 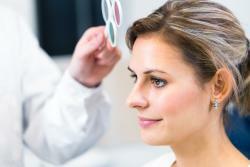 Your best bet is to schedule an evaluation at The Plano Eye Care Center. Fortunately, our Plano optometrist, Dr. Gulrez Khoja, has extensive knowledge and experience in this area as a Member of The American Academy of Orthokeratology and Myopia Control, so you’ll be in good hands. Take this opportunity to learn more about your prospects for clear daytime vision using just your own two eyes. For more information about The Plano Eye Care Center, give us a call today at 972-964-3937!